The first logo of Norsk Regnesentral (the Norwegian Computing Center) was designed by Aagot Harstad at NCC and bruhed up by a professional artist. In my opinion much better than the present one introduced two Directors ago in a successful attempt to give the institute a logo indistinguishable from a large number of other logos.This logo contains, as you can see "summing up" and "probability analysis", both important aspects in research. During the autumn of 1959, my relationship with the director of NDRE became very difficult. He wanted to transfer me and my groups in OR to a new department with a leadership that I did not regard as competent professionally. Ca. 15 December 1959 Haakon Sandvold asked me for a conference. Sandvold was a bright and rapidly rising star in the industrial establishment in Norway, then working at Norsk Hydro, later he became CEO of the large aluminium plants in Aardal. He was for many years an important player in applied research in the country. Now he is retired and has settled in the role of the "wise old man". Sandvold told me that the powerful organisation for applied research in Norway, Norges Teknisk-Naturvitenskapelige Forskningsråd (the Royal Norwegian Council for Industrial and Technical Research), had decided to transform its institute Norsk Regnesentral (the Norwegian Computing Center) from a collection of sundry computing equipment to a research institute responsible for the introduction in Norwegian business and public administration computing, operational research (OR) and applied mathematics and statistics. He asked me if I was interested in getting the professional responsibility for this project. I said yes on the conditions that nothing was disclosed before an agreement was signed and that I could bring with me the best people from my groups at the NDRE. I started at the NCC on 18 May 1960 and my group followed me during the summer. Ole-Johan Dahl followed in 1963. When I started at the NCC, we immediately got jobs that necessitated the use of simulation. 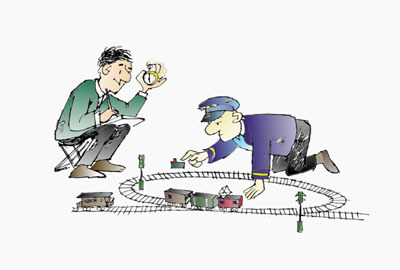 This triggered off renewed demand for a "system description and simulation language" and resulted in object-oriented programming. Stig Walstam, UNIVAC Scandinavia (left), KN (middle) and James W. Nickitas, UNIVAC Europe (right). Three happy faces among a rather bored banquet audience at the Washington Mayflower Hotel, 29 May 1962. Why do they look so satisfied? the use of computers in Norway. 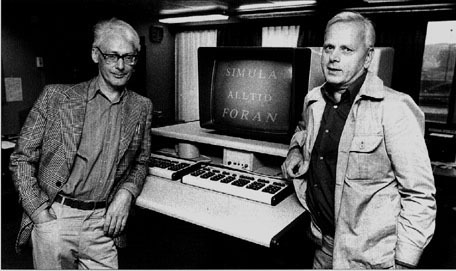 Ole-Johan Dahl (left) and Kristen Nygaard (right) before the UNIVAC 1107 with "SIMULA Always in Front" on the CRT. Director of NCC 1970-90. She became Director as the staff's candidate during the victorious buth also rather dramatic conflict (1968-69) with the institute's mother organisation, The Royal Norwegian Council for Industrial and Technical Research, led by Director Robert Major and with the Director of the Norwegian Defense Research Establishment, Finn Lied as a powerful figure in the background.